To buy or not to buy – the Tricopter? 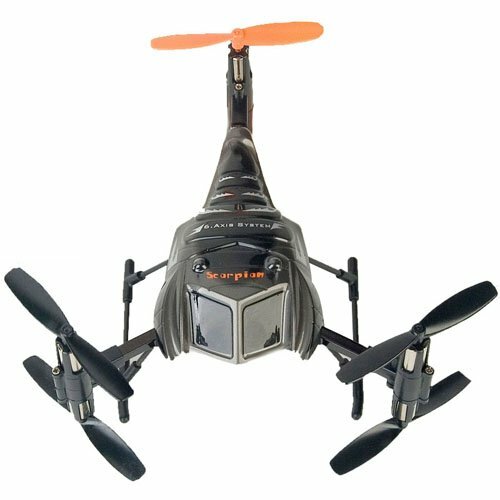 Should you buy a tricopter or not? A tricopter is a remote controlled aircraft. Three rotors, which generate buoyancy, are used for the movement and control. Three generally equal booms are attached on the trunk of the tricopter. The distance is 120 degrees to each other. However, there are also Tricopter in T-form. At the end of the arms there is a motor with a horizontally mounted air screw and a gyro sensor, which detects a positional change and reports this to the control electronics. There, the interfering influences are corrected and compensated. Tricopters are often equipped with cameras to create aerial photographs during the flight. How does a tricopter work? The control in the air takes place by increasing and throttling the engine speed. A higher speed allows the aircraft to rise into the air, while throttling the speed leads to the drop. A fourth gyro sits at the center of the tricopter and controls the servo that controls the swivel mechanism. However, balancing is only one option. In addition, the servo can be purposefully directed and the tricopter can thereby be rotated, which corresponds to a side wing aircraft. The Tricopter has several important advantages over a surface plane, because it can start and land vertically as well as fly stationary – its buoyancy does not depend on the flight speed. However, it is somewhat more difficult to control, similar to a helicopter. Each control movement affects the vertical axis of the tricopter and requires adjustment of the tail. You can control tricopter in various ways. A simple control operates with a 120 ° wobble disc mixer and four gyros. Newer and high-quality systems use intelligent electronics mounted on the fuselage of the aircraft. There is also the fourth position sensor, which detects changes in the overall position of the drone and the information is implemented with the aid of intelligent electronics and the sensors from the outriggers. Usually two of the three motors rotate counter to the direction of rotation of the third motor. If all the motors rotate in the same direction, a control change in the hover would have more effect on the tail. The intelligent controls automatically compensate for these necessary corrections with the help of the sensors. What is a gyroscope used for? A gyroscope (gyro) is used for stabilization. With tricopters and helicopters, it stabilizes the yaw axis (rear axle) and prevents unwanted rotation. Today, no mechanical gyroscopes are used, but piezocentrifuges or microsystems, also called MEMS (Micro-Electro-Mechanical System). Such a gyroscopic system is therefore nothing other than a sensor that perceives changes in the situation. With the help of gyros the flying of a Tricopters is clearly simplified and also allows the control of a Tricopters to not so well-trained model pilots. How is a tricopter controlled? A simple control using a 120 ° tumbler and four gyroscopes corresponds to that of a helicopter. In regular flight maneuvers, a constant speed is generally used and the variable angle of attack of the rotor blades either generates an output or output, ie increases or decreases. This control is called pitch-controlled. Tricopter, on the other hand, are speed-controlled. Both the output and the output are controlled by means of the motor speeds. A higher speed allows the tricopter to rise and decreases at a lower speed. With the so-called “hover speed”, stationary hovering is possible. The acceleration and deceleration forces are balanced. If the tricopter is to be tilted forwards, the speed of the two front engines must be throttled and the speed of the tail rotor must be increased. This is referred to as “pitch” and is a pivoting of the aircraft about the transverse axis. Conversely, an increase in the speed of the front engines and a reduction in the speed of the tail rotor lead to the drone tipping backwards and the opposite direction. The pivoting around the long axis of the aircraft is called roll. The tricopter “rolls” to the right as the speed of the left front engine is increased. To the left it will roll as the speed of the right front engine is increased. Greed is the turning of the aircraft about the high axis. In “Yaw Right”, the “Nose” is turned clockwise to the right. This pivoting function takes place at this type of drone by pivoting the rear engine. A loss of thrust is the consequence and lets the aircraft fall backwards. This is compensated by slight changes by the pitch gyro. Buying a Tricopter is more suitable for advanced users, because the lighter weight makes them more agile in flight. Intelligent control electronics usually compensate for this. But since there is no redundancy in the event of a rotor failure, Hexacopter or Quadrocopter are better suited for beginners.